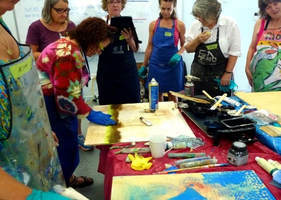 BDAS Bowral & District Art Society Inc.
*Price Includes $30 materials Fee. *There is an additional $30 materials Fee to be paid to Mo on arrival. ​Limited to 12 Students only! ​to unleash your creative potential. mage transferring, and much more! *There is an additional $30 materials contribution to be paid to Mo on arrival. ​ Image transferring, and much more! 1-25 First Parade, Raymond Island.